Ultimate Thumb Pick first generation prototypes now available! The Ultimate Thumb Pick, with its ‘pick pocket’ technology, holds the end-user’s pick of choice firmly in place. Flat picks can be interchanged, to better suit whatever stringed-instrument you are playing! Picks for stringed instruments have been around since ancient times. The sound each stringed instrument generates is unique and different compared to the sound generated when the same instrument is strummed. Conventional flat picks are commonly held between one’s thumb and forefinger, with sound being generated through strumming. A variation to this method, known as “finger picking” has evolved over the years and increased in popularity. However, finger picking involves plucking the strings with one’s fingernails, which can lead to torn nails, bleeding, and pain. 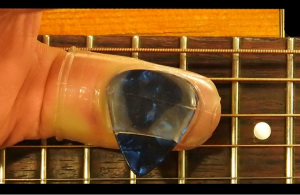 Not only is there a need in the art for devices that enable finger picking without damage to one’s own fingers and nails, but there is also a need for a similar device for the very unique digit known as the human thumb, which generally plucks the strings from a different angle, compared to the upstroke of the human fingers. The present invention is just that very device, solving the special needs specific to the thumb. The “Pick Pocket” technology hugs & holds the end-user’s pick of choice firmly in place. Also, picks can be interchanged to better suit whatever stringed instrument you are playing! Metal picks for banjo or pedal steel, and choose a personal favorite from the wide variety of flat pick materials for guitar, mandolin, or any other stringed instrument you might be performing with…This cot material has more elasticity than the finger pick cots, which was necessary to create a “one-size-fits-most” first generation thumb pick that would accommodate all the variations found in the human thumb. 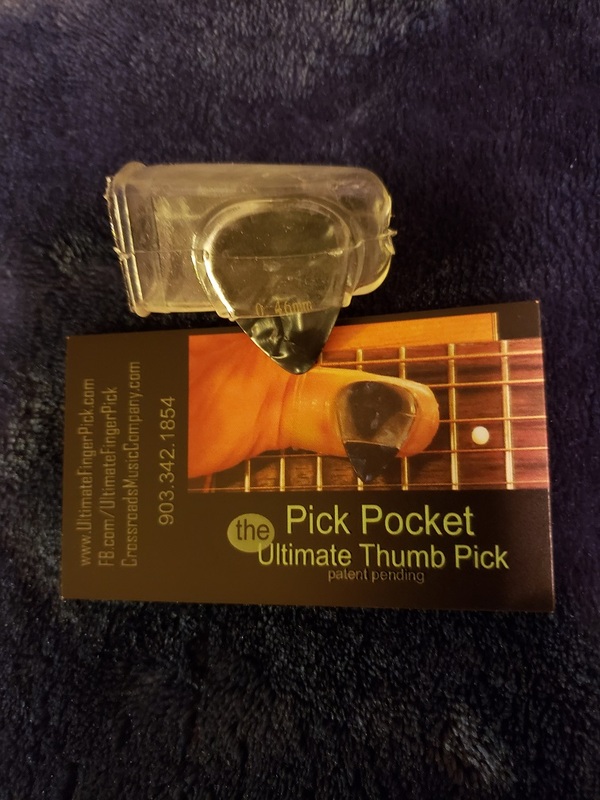 We have NOT pulled the trigger on the final steel mold necessary for mass production of the Ultimate Thumb Pick, so we welcome end-user feedback at this stage in development. We believe we’re there, but due to the wide range of playing styles, we are open to a couple more tweaks, if necessary. 3 reviews for Ultimate Thumb Pick first generation prototypes now available! Hi Tom! I emailed my response to you, with details…Yes, I can customize the pick pocket on my end, prior to shipping. Just leave instructions during check-out, in the “notes” area. Thank you for your interest in our products! Hello – I love the concepts of your products!! I currently use Dunlop Tortex .50 picks (the red ones) can I use these thin picks with this ultimate thumb pick? I love the clear design as well – are they clear by design or are there various colors? Thanks! !